As we begin our final month of the 2013/14 ski season, I believe it is important to remind everyone that our operational hours are adjusted as our member and guests visits decrease. Schedule adjustments generally take place after mid-March, or as weather may dictate. Please refer to the schedule within your directory or accessible via the Season Calendar link directly on our website. And as always, you can verify we are open by calling the office 262-246-3090 or checking our website for Dennis’ daily message. 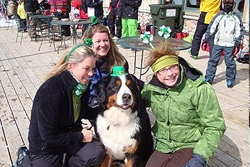 The last scheduled “Event” of the season is our St. Pat’s Deck Party, Sunday March 16th. Last season’s pictures can be found on the website at Ausblick.org. Click on the Photos drop-down menu, 2012-2013/St. Patrick’s Day 2013. Two seasons ago we skied in 81 degree weather, last year’s party wasn’t as warm, yet made for a great party still. Will the “luck of the Ausblick Irish” continue??? Stop on by and find out first hand. There will be food and beverage available, for as long as it lasts. As we wind down the 2013-14 season, it is important to acknowledge the awesome support our Ski School and Ski Patrol have provided for our Membership and Guests. Our Ski School, under the Leadership of Jim Polaski for the past twelve years, has been the foundation for many of our Members and Guests in their instruction of skiing and snowboarding. From first timers to those simply hoping to improve their skills, Jim and his staff have insured Ausblick is able to provide the skills training Members and Guests rely upon. Our Ski School is one of the best in the State, please take the opportunity to thank Jim and his staff as the season winds down. I’d like to also Thank our Ski Patrol for the outstanding job they’ve done throughout the season. For anyone not aware of it, our Ski Patrol is comprised of Ausblick Members. Their preseason training and re-certifications start months before the snow hits the ground and it’s not uncommon to notice additional training taking place on the hill shortly after we’re open for skiing. Additionally, Ski Patrol has sponsored our January Men’s Day for the past two years and as always, Hosts their Annual Ski Patrol Carnival which is one of the social highlights of any season. I also would ask that words of appreciation be extended to Patrol Representative Nick Rogne and his staff as the season winds down. And finally, save some of those kudos for Dennis and his staff. Some are highly visible, many quietly go about getting things done so our Members and Guests can enjoy the Ausblick experience. Please offer them a few kind words over the remainder of our ski season. One final reminder, Ausblick will remain open, although with a sensible modified schedule as crowds wind down. And while we won’t be making snow again, grooming, tilling and most other creative things will be done to reasonably extend our season, so long as enough members are interested in coming out to ski and snowboard. Sunday’s Deck Party is only the middle of March. It’s likely we have a ways to go before we put the 2013/14 season behind us. With the Holidays behind us, time for a bit of recovery and the “polar vortex” a cold memory, we’re finally settling into our typical ski season at Ausblick. Last Sunday was an incredible day at the ski club, with likely a record attendance for the season. Dennis sent out his early season “friendly reminders” last week in an e-blast, however there’s one item I’d like to add about parking on very busy days, which is often at a premium. I’d ask that families be conscious of the impact on parking availability if they decide to arrive separately, utilizing two or more spaces. Generally this doesn’t present a problem, however those sunny, ideal ski days on the weekend can present a problem for families arriving later in the morning or afternoon. Your co-operation would really be appreciated by those looking for parking. Throughout the season Dennis receives a lot of e-mail sent to him for various reasons. He asked me to inform everyone that using the “CONTACT” section of the website (“ausblick.org” , main-page, upper right corner) is the fastest way to reach him. Correspondence finds its way directly to his cell phone. And by the way, letters about what staff is doing right are always appreciated. Moving on to Social Events; our January Men’s and Ladies Day events are scheduled with flyers posted on the website. 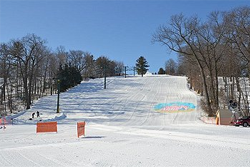 Looking forward into February, Our Annual Ski Patrol Carnival is scheduled for Sunday the 9th., a Valentine’s Theme Night will be held on the 15th. (Adult Night), followed by our second Men’s and Ladies Day events towards the end of the month. Also, On Wednesday, February 19th, Lena and Tom will again provide music for Adult night. Please watch for e-blasts and check in at the web-site for further information as it’s available. Thanks to Perrie Dralle and Tiffany Becker for pulling our social events together. Ausblick has historically built our Membership Waiting list through Members bringing Guests to share the experience. This process continues to serve our club well, however did you know we have a “referral program”? If your family is responsible for a future member submitting an application, you’re entitled to a couple guest passes once your “friends” become members. It’s important to note your name must be on the application submitted for us to track and fulfill the program. We’re you aware that future members can purchase a “Wednesday Evening only Membership” once their application is accepted? What better way to experience Ausblick while on the Waiting List and start making new friends on Wednesday Evenings. If you have questions, please contact Dennis Evinrude. In closing, I’d like to Thank Dennis (General Mgr), Wes (Outside Operations), Megan (Front Desk Mgr) and all our Ausblick Staff, Ski School and Ski Patrol. The season came upon us quickly this year with an early opening date, however it also caught us scrambling to work a few issues out. It’s nice to recognize that with a lot of effort by those involved, we’re “into the groove” now and off to what could be one of the best ski season’s in years. Will we be skiing in 81 degrees during the St. Pat’s Deck Party as we did two years ago? Time will tell! Thanksgivings only a week away, temperatures continue to fall and before we realize it, our 2013-14 ski season will be upon us. The purpose of this newsletter is simply to let you know Dennis, Wes and the staff continue to diligently work towards opening the club for our ski season. Weather obviously is a consideration, however Wes has tested out the snowmaking infrastructure during last week’s cold snap and it’s more a matter of the weather than anything else. Fall has arrived, the temps are cooling down and Ausblick is actively involved in preseason activities. This newsletter is being sent via E-Blast (e-mail) and paper mail to insure the information reaches everyone. This past Sunday’s Ski Sale was a huge success! Nearly $31,000.00 worth of clothing and equipment was exchanged between sellers and buyers during the two and one half hour sale. And as was the case last year, most of the sales were completed within the first 60-75 minutes of the event. This year it appeared there were more “kids equipment and clothing ” than in previous years, which always is appreciated by anxious buyers. While the mild temperatures made it challenging to open this season and the rain certainly played a role in ending our season on Sunday, April 7th; overall we enjoyed another very successful ski season. Looking back at the weather charts, weekends were equally split between sun and overcast days, however Wednesday Evenings clearly took the honors with the majority providing clear skies and mild temperatures. As for the bone-chilling cold spells of some previous years; they simply didn’t appear this season.